A NEW training hub in Woking will help give vulnerable teens a vital leg-up in their quest to stand on their own two feet, the manager of a crucial local charity says. Staff at Transform Housing & Support, based in Heathside Crescent, cut the ribbon to the innovative facilities last week. Hosted by The Crescent, Transform’s supported housing project for the borough’s most in need, the centre will help users sustain their education, complete training courses and find employment. The facility comes in two parts: a study centre with computers, internet access, Mic-rosoft Office and specialist software, to be used for individual study, job applications and group workshops; and a training kitchen for individual life skills coaching, cookery sessions and learning about food hygiene. The hub was funded by a generous donation in the memory of international businessman Andy Stallman. Theresa Duckett, Housing & Support Manager at The Crescent, said: “Eighteen months ago we had the idea of turning a storage room and staff kitchen into a training hub for our young people. “Thanks to these generous donations in memory of Andy Stallman and Michael Varah, this idea has become a reality. 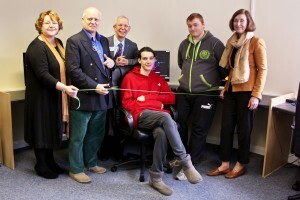 “The young people are really excited about the training hub. Our initial plans include a photography club, CV writing sessions, healthy eating workshops, an Indian cookery course and food hygiene training. The project will also receive funding from the Michael Varah Memorial Fund, a charity founded to continue the beliefs of the former Surrey Chief Probation Officer. Representatives from both donors attended the event on Tuesday to mark the official opening of the training hub. Oliver Buckley and Sally Varah were each presented with a jar of homemade mango chutney, made by some of the young people in the training kitchen.